I have to be honest; I’m just not a huge fan of Christmas anymore. Sure, I know, there are a lot of people like me who decide to use every December as a chance to get snide, snarky, and cynical, to bemoan the commercialism or the often overly-manufactured good cheer that accompanies every Christmas season (or something like that). But I have no problem with Christmas, or Hanukkah, or Kwanzaa, or Ramadan, or even the rampant consumerism that centers on all of them. Well, maybe not on Ramadan, but you get the idea. It’s just that Christmas, for people like me, is always a stark reminder of those in our lives who are missing. For me and my family, that person is my Dad. My father passed away over eight years ago, but as anyone who has ever lost a parent can tell you, when all the grieving is done, there’s still a void left behind that’s never really filled. And at Christmas, when my admittedly somewhat dysfunctional family gets together to acknowledge, if not necessarily celebrate, the holiday, that void just seems ever more obvious. So every holiday I’m given the choice: get depressed, or find some way to cheer myself up. Needless to say, I choose the latter, and the way I choose to alleviate my sadness is the same way I choose every year: a mini-movie marathon of two singular 1980s comedies, the seasonally-appropriate A Christmas Story and the significantly less seasonal My Favorite Year. 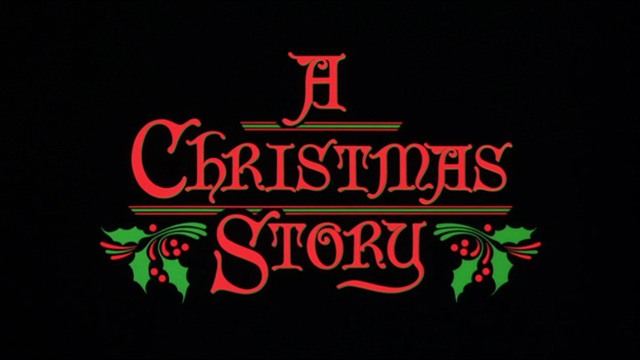 While it’s now regarded as the definitive Christmas comedy, complete with an annual 24 hour marathon beginning every Christmas Eve, there was a time when A Christmas Story was a fairly unknown and little-regarded film that had a blink-and-you’ll-miss-it theatrical run in 1983, and otherwise seemed destined for obscurity. Back in the days when movies aired in syndication on over-the-air channels 6 or 7 nights a week, A Christmas Story was just another Christmas movie that popped up every holiday season, squeezed in somewhere between the badly colorized re-airings of It’s a Wonderful Life and Miracle on 34th Street. I was very young when I first saw the seemingly inauspicious movie sometime back in the late 1980s; I certainly don’t remember the specific year, but I remember when I first saw A Christmas Story it was with my Dad. My Dad was a very good, very kind, and very loving man, but even he would have admitted that he was sometimes taciturn to a fault. He could, and would, laugh, but when he did, it was only briefly, and his smile would quickly fade away. I think A Christmas Story was probably the first time I had ever seen him laugh so long and so hard that he actually tears in his eyes. And from that very first viewing, I was right there, cackling along with him every step of the way. Everyone has seen A Christmas Story now, but back in the day it was something to be one of the few people in an Elementary school class to have seen it. Inevitably, I would be cracking up the other kids who hadn’t seen it by quoting lines of dialogue or describing a scene or scenario from it, or sharing a knowing laugh all over again with the few other people who had. As the years went on, of course, more and more people starting discovering it each year as its reputation grew and grew. It’s with some pride that I can honestly say that I was part of the first wave of people who truly discovered it, and therefore I’ve always felt some degree of ownership over it now that it’s seemingly become everyone’s favorite go-to Christmas movie. The brilliant thing about A Christmas Story, and what I think helps it resonate among people of both my generation and my Dad’s, besides it’s wonderfully balanced mix of biting humor and genuine warmth, is that it’s just an amazingly honest piece of anti-nostalgia. Set as it was in the 1940s, when my Dad was growing up, it was an accurate reminder of a lot of the less-than-ideal things he experienced as a kid that he had never seen acknowledged anywhere else before. Conversely, for a kid like me, it endorsed the long held belief that the nostalgic idea of “the good old days” was always, to be blunt, a crock. Coming from a generation or two ahead of us, the little boy Ralphie fiercely coveted his Red Rider BB Gun just like we coveted our Cabbage Patch Kids and Nintendos. Our parents, as it turned out, felt the same way about their parents as we felt about them; we were told to never use bad language while are parents would use it like it was going out of style. We fantasized about getting revenge on our elders when they made us angry, or getting excused from homework because we were just that brilliant. I could go on and on, of course, but the point remains, A Christmas Story validates for everyone who watches it that they’re really no more or less messed up than everyone who came before them. Essentially, it’s nostalgic for exactly the type of things you’re not supposed to be nostalgic for: the juvenile desires of children and adults alike, and the colossal embarrassments of our lives that we would all like to forget, but find in ourselves to eventually laugh at instead. Oh Fudge, indeed. Of course, My Dad eventually taped the movie off of television at some point and we rewatched it year after year after year, laughing just as hard each successive year as we always did. As I progressed through high school, I began developing into the avid cineaste I am today, and my Dad was always my willing accomplice. Back in the 1980s, when I was too young to have discriminating taste, my Dad taped tons of classic movies off of PBS, secretly enamored with the then amazingly new concept of the VCR. Because of his foresight, I had an astonishing wealth of classic cinema to watch when I came of age, and he watched as much of it with me that he could. To a great degree, watching movies together was the way he and I had always bonded, starting with Universal Horror movies as a kid and continuing as I approached adulthood. In 1997, I moved out to Los Angeles (for film school, of course), and for the first time in my life, I had cable television. And not just cable, but Turner Classic Movies, AMC, and Fox Movie Channel, all of which showed movies, uncut, without commercials, and, when applicable, in WIDESCREEN! Back then, you have to understand, most movies were released on VHS in Pan & Scan; seeing movies in their full and original format was typically reserved only for people who owned Laser Discs (in other words, no one). Needless to say, being my father’s son, I went completely tape happy, and thanks to the then burgeoning medium of the Internet I was able to print out full, monthly schedules and strategically plan my recordings of he movies that either I wanted to see or simply had enough of a critical reputation to be part of my collection. My still formidable collection of VHS from my college years. 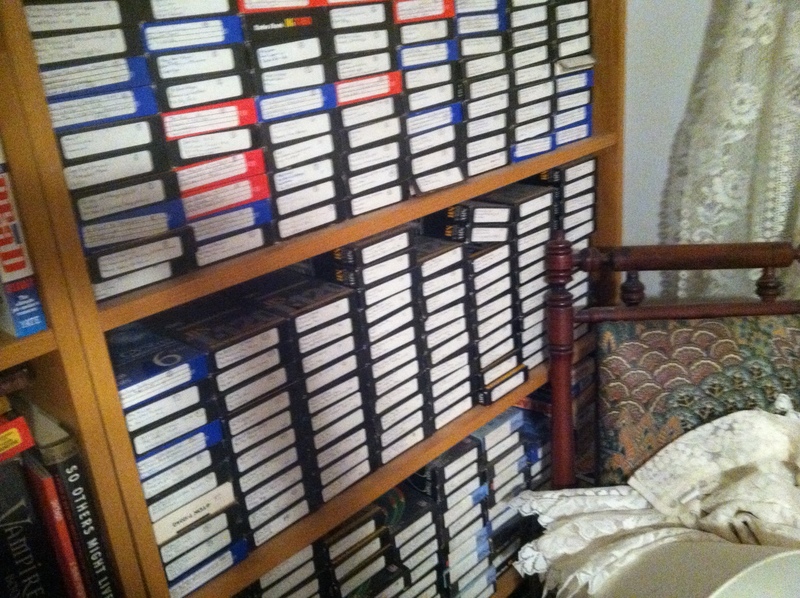 Total tally: 698 movies on 231 videocassettes. 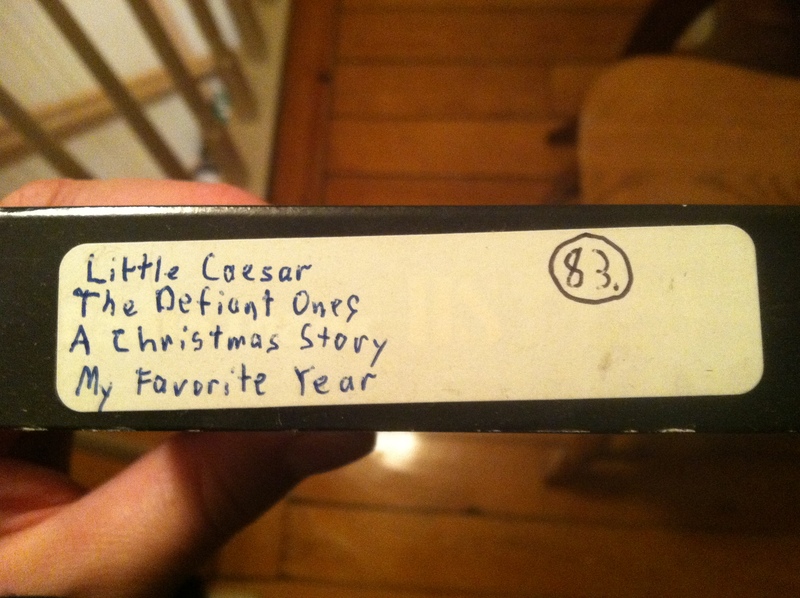 And so, on that same tape, just after A Christmas Story, I recorded My Favorite Year. My Favorite Year, released the year before A Christmas Story, is a funny, nostalgic romp about a week in the life of a young television writer working behind the scenes at the most popular comedy show on television. The film is loosely inspired by the real-life experiences of its executive producer Mel Brooks, who along with such legendary comedic minds such as Woody Allen, Carl Reiner, Neil Simon, Larry Gelbart, and Mel Tolkin, worked as writers for the great Sid Caesar on his highly influential sketch comedy programs Your Show of Shows and Caesar’s Hour. Set in 1954, this was still the age where most television was live, in this case from New York City’s Rockefeller Plaza. The writer, named Benjy Stone (shortened from Steinberg), played by Mark-Linn Baker, is an idealistic, earnest, likable young man who is still fairly naïve to the ways of the world. Thrilled to death when his childhood hero, Alan Swann (Peter O’Toole), the fictional, faded movie star not-at-all loosely inspired by Errol Flynn, is booked to be a guest star on the show, Benji finds himself forced to serve as Swann’s handler when his “hero” shows up drunk out of his mind to the first day of show week. During their week together, as Benji, unsuccessfully, attempts to keep Swann sober, Swann teaches him to enjoy life and overcome his neuroses when it comes to women. Conversely, Benji, a Jewish kid from Brooklyn, reminds the aloof Swann about what’s most important in life, and gives him the confidence to reconcile the movie star he was with the man he is. That winter break that year, as I always did, I went home with an assortment of videos I recorded during the semester, including the one with A Christmas Story and My Favorite Year. A few days before Christmas, my Dad and I sat down to watch A Christmas Story, and as usual, we laughed until it hurt. As it turns out, since A Christmas Story was only about an hour and a half in length, we kept the tape rolling and watched My Favorite Year, for what was for me, the first time. Being an aspiring screen and television writer myself and like my dad a big Errol Flynn fan, I loved it, and from then on became a devotee of Peter O’Toole. The original VHS containing "A Christmas Story" and "My Favorite Year" that I watched with my Dad. The next year, as was custom, we sat down and watched A Christmas Story again, and as it happened, I had neglected to hit “STOP” for some reason or another, and we were again sucked into watching My Favorite Year. The year after that, naturally, we sat down to watch A Christmas Story again, and by that point I acknowledged the burgeoning tradition by joking, “Are we going to watch My Favorite Year again, too?” My father laughed and replied, “We’ll see.” We watched it, of course. By this time, it was Christmas 2000. In October 2001, my parents came downstairs one morning to discover that our family dog, Justin, was no longer able to stand up on his own power. It wasn’t a surprise; Justin had been a sickly dog for over a year. In fact, when I last said goodbye to him on the morning of September 11 before going to catch what was supposed to be my flight back to Los Angeles, I knew it would probably be for the last time. My Dad was 65 at the time, but due to the situation he was forced to carry the seventy pound Labrador Retriever to the car, and then into the Veterinarian’s office so Justin could be put to sleep. When Dad called me later that day to tell me the sad news, I asked him if he had any trouble carrying Justin. He replied that it had been rough going, and that he thought he might have pulled something because his midsection was bothering him. “I’m sure it’s nothing, though,” he said assuringly. A week later, after his pain hadn’t subsided, Mom forced Dad to go to the ER. After a few days of waiting on some results, my Dad called me again, to once again deliver bad news: he had been diagnosed with pancreatic cancer. Surgery was hastily scheduled in early November to try to remove the diseased tissue; the procedure was very intrusive and even if successful would involve a long recovery. Of course, I came home as soon as possible to help out and support him. Post-surgery, Dad was in the hospital until after Thanksgiving; unfortunately, after a few weeks at home, he experienced significant complications and was back in the hospital until just before Christmas. With everything that was happening, it wasn’t until a few days after Christmas that we decided to watch A Christmas Story. My Dad at the time was still very weak, and had taken to going to bed very early. When the film was over, I turned to him and asked if he wanted me to keep it on for My Favorite Year, too. A few weeks later, after his strength returned, I flew back to Los Angeles. We never got to watch My Favorite Year that trip. To be honest, it was apropos; for both of us, 2001 had been our worst year. Throughout the rest of winter and spring 2002 my Dad continued treatment and began to show some improvement, and even had aspirations of going back to teaching in the coming fall semester. In May, my father went in for a follow-up, and again the news wasn’t good at all: his cancer had returned, and had now spread from his pancreas into his liver. Further surgery was no longer going to be an option; all that was left was intense chemotherapy. Two months later I left my life in Los Angeles and moved back home to help with his care. As the summer turned to fall, he showed no signs of improvement, losing weight and becoming almost perpetually weak. About a week before Christmas, I suggested we watch A Christmas Story, hoping that it might cheer him up and, by proxy, me as well. As we watched the movie, I was struck by the fact that my Dad wasn’t laughing. He would smile at the funny parts, but he wouldn’t, or couldn’t, laugh. When the movie was over, I hit “STOP” on the remote, and got ready to help him up to bed. It was then I fully realized why he had wanted to watch both movies. It was because he knew, as I did, that it would be for the last time. That was Christmas 2002. On February 22, 2003, my father, Dr. Nicholas F. Morris, passed away. At the time, someone diagnosed with pancreatic cancer was expected to die within six months. My Dad lived another sixteen. In late 2003, they released a 20th Anniversary, Two-Disc DVD special edition of A Christmas Story which I eagerly was set on purchasing. As I was waiting on line to pay for it, something told me to go back and see if the store I was in also had a copy of My Favorite Year. As it turns out, they did; I purchased them both, and I own them still. For the entire year, they sit together on my bookcase, bound to one another by a red holiday ribbon. A few days before every Christmas since, I take them down off the shelf. First I put A Christmas Story in my player, and for an hour and a half I soak in the childhood remembrances of little Ralphie Parker as he dreams of finally getting his Red Ryder Air Rifle for Christmas. When it’s over, I take it out of the player and swap it with My Favorite Year, and I watch enthralled as the dashingly drunken Alan Swann shows young Benjy Stone the time of his life. And as I sit there on my couch in front of the television with an empty spot besides me, I smile, because for three hours and change, every Christmas…I get to be with my Dad again. If you would like to learn more about pancreatic cancer, or even make a donation to the Lustgarden Foundation for Pancreatic Cancer Research, please go to www.CurePC.org or www.lustgarten.org. Posted on December 24, 2011, in The Antiscribe Analyzes (Essays). Bookmark the permalink. 1 Comment. That is such a nice tradition. I’ve been watching A Christmas Story every year since I was a kid. I would love to visit the museum. I just came across this earlier http://www.achristmasstoryhouse.com/ I’ve somehow never heard of My Favorite Year but I always enjoy anything Mel Brooks touches so I’m looking forward to watching it. Thank you for sharing.